Jacques, B. (2007). 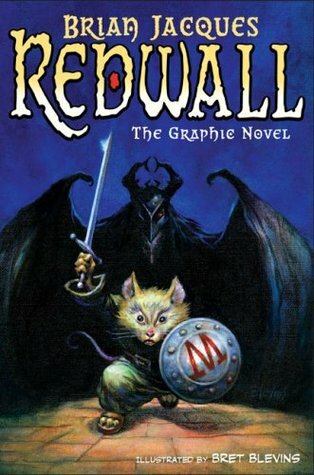 Redwall: The graphic novel. New York: Philomel. Personal reaction to the book: Meh. The art isn’t particularly striking or groundbreaking. In fact, it reminds me of the art from the animated TV series but with heavier inking. The story is also familiar to anyone who has read the original, so nothing new to see there either. In fact, this edition has to speed through some things (i.e. the Matthias / Cornflower romance) in order to get through all the main plot points. It could be a good way to get early readers interested in the Brian Jacques canon but, like the source material, it’s definitely on the children’s/YA cusp. As graphic novels develop, we are likely to see more and more adaptations of classic material, but as this book shows, the need to hew close to the original can mean a lack of originality that deadens the work for fans of the text version. In short — why bother? Author facts: Brian Jacques is a Liverpudlian with Irish roots. He worked in his youth as a seaman and truck driver. He credits a former English teacher, Alan Durband, for showing Redwall to a publisher. Durband also taught Paul McCartney and George Harrison.